The Dura+ range have a number of benefits compared to the standard range. They will work down to a lower outside air temperature -10c, and have a higher COP range, up to COP 6 over their operating temperature. 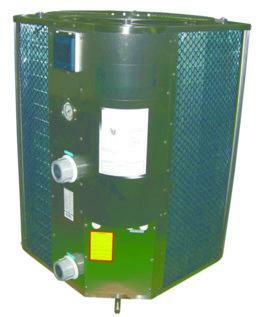 These pool heat pumps can be used to heat swimming pools all year round with excellent energy efficiencies. The Duratech range of heat pumps is recognized as one of the industry leaders in the swimming pool heat pump market with their quality and reliability. You might find cheaper alternatives but in terms of service and back up Duratech are second to none, plus being a European company you can be sure that service back up and spares will not be an issue in the future. All the models in the range have titanium heat exchangers for long life and excellent resistance to salt water and pool chemicals. With our experience of air source heat pumps if you are not sure which model will best suit your swimming pool needs just give us a call and we will be happy to talk through the options available. We can also supply the full range of filters pumps & valves to complete your installation; once again we are happy to give advice on the best options 0845 026 7796. For a cost of 175 euros you can have the system shipped to any European country listed. To add this charge please see the ship to European countries charge listed at the bottom of the main product categories.